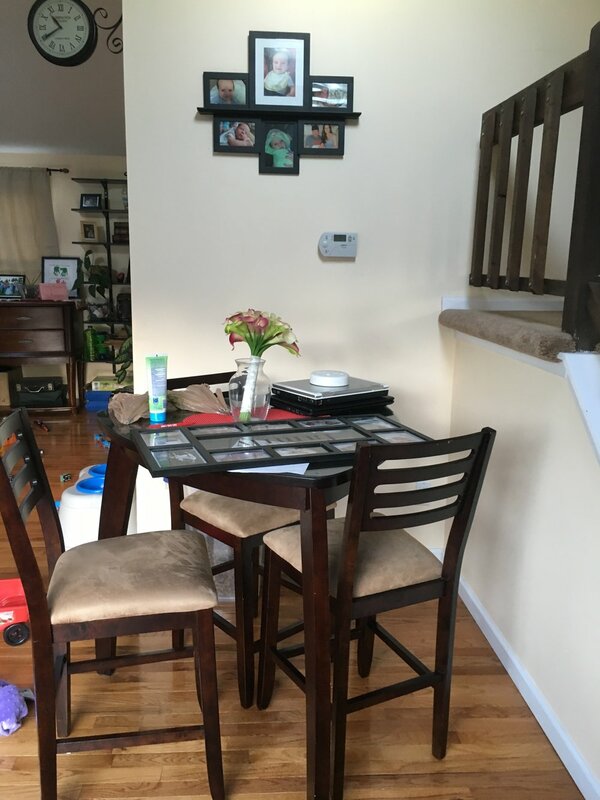 Before and After: A Living and Dining Room Makeover — 5 O'CLOCK DESIGN CO. When the client first contacted me about this project, I was pretty excited to tackle this multi-use space. The set up they currently had was functioning as a playroom, office, and catch-all area that was drastically underutilized but there was SO MUCH space, gorgeous vaulted ceilings, and they didn't want to keep any of the current furniture. Can I just tell you how much I love a blank a canvas!? The challenge was to reclaim a portion as an adult living area and a separate dining area, which meant two whole rooms worth of furniture and accessories on a modest budget. I also love a good challenge! After we met with the client and went over their answers to our Style Survey, we put together two looks for them to choose from. One is a little softer and more casual, the other uses darker tones and conveys a bit more formality. They said they really wanted a sectional sofa, but there just wasn't room in the floor plan and we opted for a sofa with an attached chaise. This a great option if you want that lounge-y feel but don't have the space for a full-sized sectional! The client chose the softer, more casual design but said they would prefer something other than leather for the armchairs and a coffee table with some storage. The other piece they weren't crazy about were the side cabinets for the dining room, and said they wanted more detail on the doors. So we sent over the following options for these three items. After all the new pieces arrived, we scheduled the install/styling session and in about four hours they had a grown up living area, dining room, and welcoming entryway furnished, accessorized, and under budget!